Imagine your site goes down for a few days. Panic, right? What if you shut it down on purpose? In anticipation for its relaunch, that’s exactly what independent fashion retailer Johnny Cupcakes decided to do. This tactic, along with all other business decisions, works in tandem with the three, interdependent pillars that define the Johnny Cupcakes brand: personality, exclusivity and community. 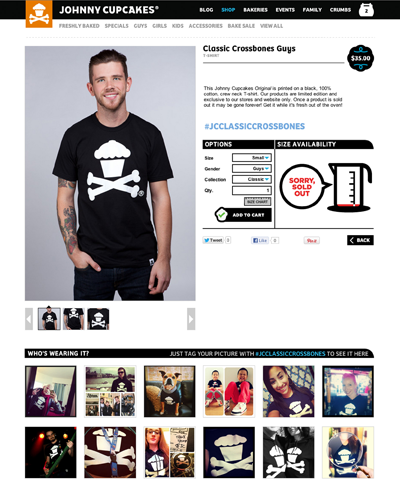 For the unfamiliar, Johnny Cupcakes is a clothing line that uses cupcakes as the prominent design for its merchandise. The company does not sell real cupcakes; however, they do provide them to its customers at special events and sometimes in its brick-and-mortar locations. Its products are highly limited, with many of its T-shirts (the company’s main attraction), printed in the hundreds, if not lower. Since these feelings of exclusivity and community are so inherent to Johnny Cupcakes, customers not only camp out in front of stores, but also engage with each other online – many times in third-party message boards, they create. One of the ways the company did this was by providing fans with a platform to share photos of themselves wearing their favorite Johnny Cupcakes items via Facebook, Twitter and Instagram. And, almost instantly they become the featured website model (as pictured). Johnny Cupcakes calls itself “An Unordinary Bakery,” and its e-commerce presence is definitely unordinary as well. For example, the home page feels less like an e-commerce store and more like a blog. Other features of the new website include a “Family” section, which puts a larger face on the brand by highlighting around 60-80 people that really make the brand possible. 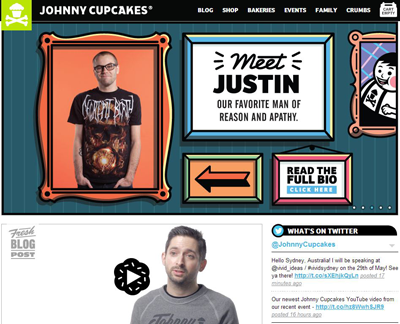 JohnnyCupcakes.com will also feature online events, such as secret collections and pop-up shops that exist only online.